This is a great class for both beginners and those who have played with fused glass before. 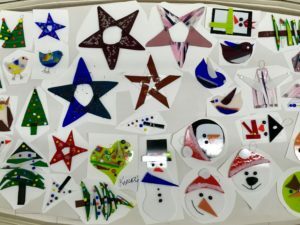 In this 2 hour, informative and fun course you will learn some of the basic skills needed to start creating fused glass projects on your own, including glass cutting, grinding, material control, layering, kiln knowledge, and more. You will make 3 Christmas ornaments from a variety of designs offered. All glass and working supplies are provided. Projects will be fired and ready for pick up a few days after class. Call 250-542-6243 or drop by the Arts Centre to register today!